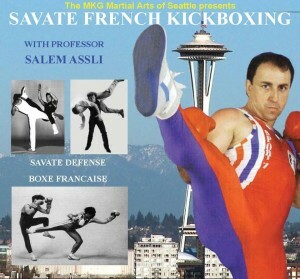 Join us on September 19-22, 2014 for a series of workshops with world famous Savate and Kali/JKD instructor Professor Salem Assli. For the first time Professor Assli will be teaching Canne de Combat and Kali/JKD in the Pacific Northwest. Don’t miss this rare opportunity. This is a unique opportunity to visit the Emerald City and train for 4 days with one of the worlds foremost martial artists. IMPORTANT – Testing will be for 2 day weekend attendees ONLY so clear your schedule.